Brown Union Fiber Brush – Block: 7-5/8" x 3-5/8" with hand strap. 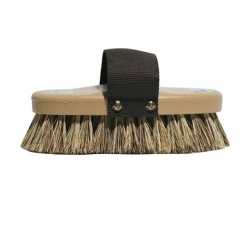 Bristles: 1-3/8" brown union fiber. Grip Fit horse grooming brushes feature blocks made from molded polypropylene foam, allowing a more comfortable shape to better fit your hand. Will not rot or mildew.